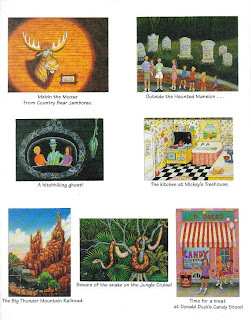 In 1995 Kathy Jakobsen (My New York, Johnny Appleseed, This Land Is Your Land) released a picture book entitled Meet Me in the Magic Kingdom through Disney Press. 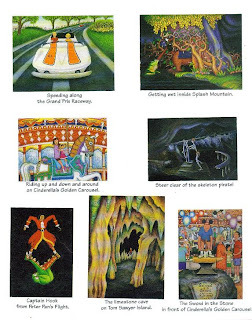 The story, which is conveyed through fifty oil paintings, tells the story of Kate, who is from New York, and her cousin Bonnie, who lives in Minnesota, and their family vacation to the Magic Kingdom. The story itself can, at times, feel quite disjointed since you do not know this family or their personalities, and the introduction to these characters come as details from the attractions are also being wedged in to a few lines of text. As well, as time will often do, the book is dated by the inclusion of attractions that are no longer present (Alien Encounter, Mickey’s Starland, 20,000 Leagues Under the Sea). The illustrations, however, make this a perfect reminder for children coming home from Walt Disney World or as an anticipation builder for children getting ready for their trip. These paintings capture everything that makes the Magic Kingdom, the excitement, the crowds, the colors, the lights, the warmth, even the exhaustion. I even felt that if I listened real quietly and closely I would here the laughter of the guests and the music of SpectroMagic. Meet Me in the Magic Kingdom is essential gear for a Young Adventurer, especially the preschool adventurers. 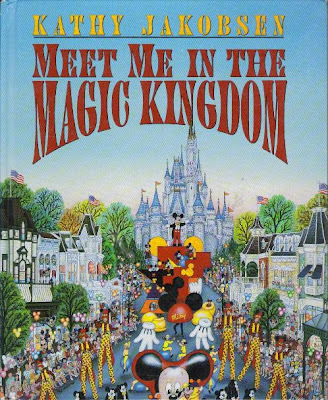 Even though there are attractions included that are no longer within the Magic Kingdom, this book will succeed, with its tremendous artwork, in giving a child a well-rounded idea of what the Magic Kingdom has to offer them. Once there, with so many varied options for adventures, the attractions now missing will be forgotten in a sea of new explorations. That's a super-cool looking book! I love stories that use WDW as their setting. The illustrations are fantastic as well!